As any regular reader would have noticed, I'm a frequent visitor to the Mortimer Bay reserve at Sandford. I often just drop in on my trips round the local traps. This particular morning, as well as birding the area, I hoped to get some shots of a Grey Shrike-thrush that I have regularly seen in an area that seemed to present some "possibilities". The area is only a few yards into the reserve, and I could hear the shrike-thrush's unmistakable metallic contact call as I got out of my vehicle, so I set off with high expectations. Within minutes I had taken several images of this shrike-thrush as it tore at bark looking for prey (from the images, spiders), but the call of a Fan-tailed Cuckoo side-tracked me. It was obviously close, but try as I might, I couldn't locate it. I narrowed it down to one mid-sized eucalypt, and in the outer canopy. Eventually it flew a short distance to a nearby limb and I managed to get the shot shown at right, resplendent with a hairy caterpillar. 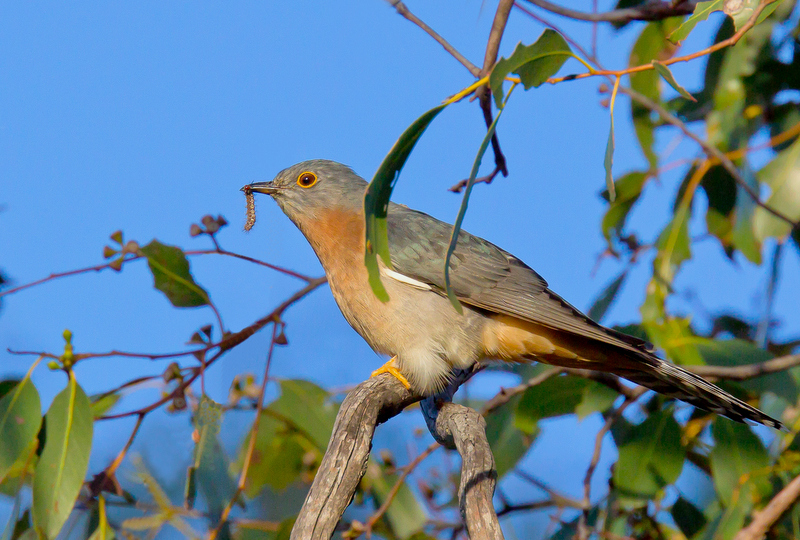 In my experience, caterpillars are the main prey for cuckoos, and I'm always surprised that there are apparently so many around during the colder months. This bird may well be the same individual that I had seen and photographed as described in my previous story. 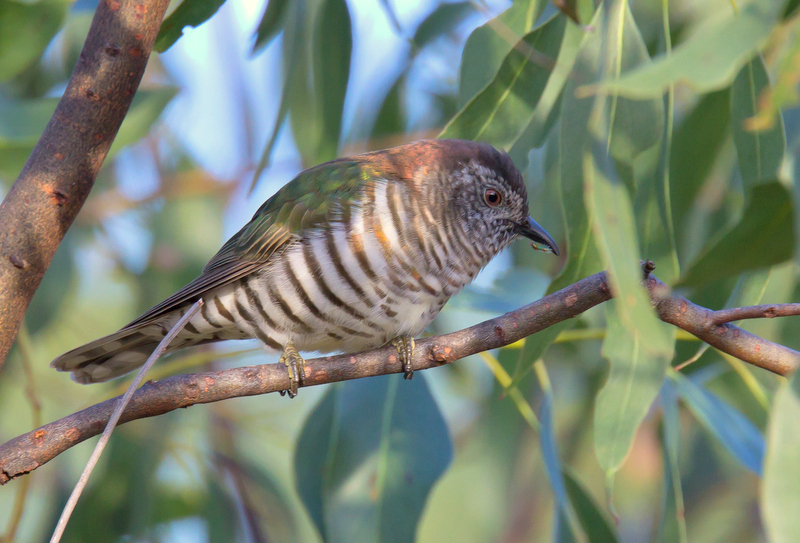 I hung around, now completely absorbed by the cuckoo, the shrike-thrush forgotten. 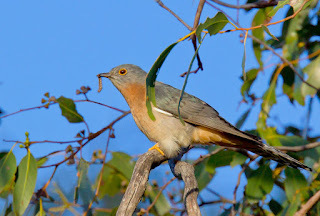 The cuckoo appeared to be finding most of the caterpillars from the outer foliage of a flowering peppermint, and was joined by the occasional New Holland Honeyeater attracted by the blossom. While watching these and a nearby, very vocal Yellow-throated Honeyeater through the binoculars, I noticed another small bird that I couldn't immediately identify. I watched for some minutes, the bird giving only brief glimpses and somewhat silhouetted against the sky. Eventually it dropped down into the lower parts of the gum almost immediately in front of me. 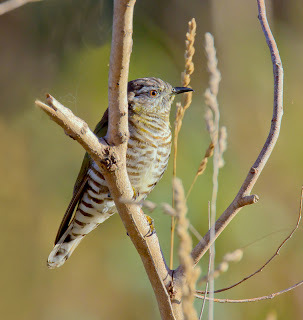 It was a Shining Bronze-Cuckoo, a great Winter find. In the dappled light, not in the greatest position for photography, but with the bronze-cuckoos you have to take what you can get! This bird too, had a small, very small, also hairy, caterpillar, as seen in the lower image. It flew back into the canopy and for the first time, gave a single "fwee" call and almost immediately a second bronze-cuckoo appeared. I soon had another brief photo opp., when the second bird 'propped' on a low branch (top image) between short forays to scratch among the leaf mulch. I've never witnessed this species doing this before, and as it has very short legs unsuited to foraging, I'm guessing that they seldom do. That would perhaps suggest a paucity of suitable food sources. Another excellent morning and I even managed some passable Grey Shrike-thrush shots too. The bronze-cuckoos (Shining and Horsfield's) are much smaller than the fan-tailed (17cms vs 26cms), and all cuckoos, including the largest, the Pallid Cuckoo, are essentially Summer migrants to Tasmania, although Fan-tailed Cuckoos are fairly regularly seen here in Winter, mainly in coastal areas. Lovely sots of both Cuckoos - and surprising to find the Bronze Cuckoo this time of year!